Facebook: Works on all these MyGicas: 1200 (not 2014 + Edition), 520E, 400, 120, 510x, 500x, Pivos Xios DS & JynxBox M6. 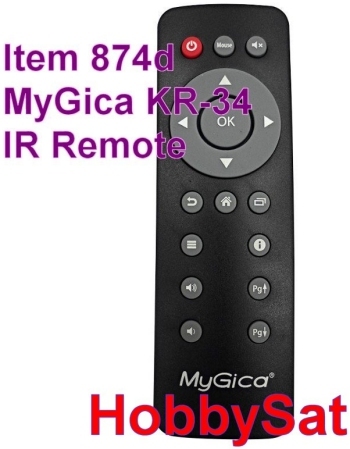 Item 874d: $19.95Can or $15.35us Brand New. 5x1.5x0.8 inches. 127x38.1x20.3 mm. Shipping Weight: 68 grams. 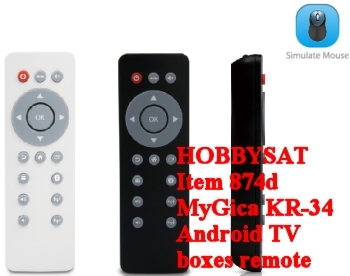 1200 (not 2014 + Edition), 520E, 400, 120, 510x, 500x, Pivos Xios DS & JynxBox M6 IPTV devices! in the palm of your hands. 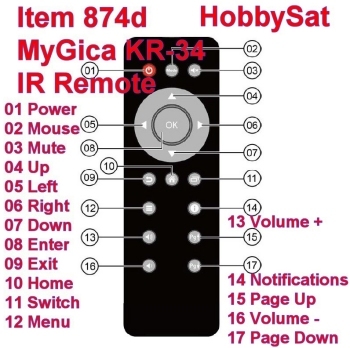 The MyGica KR-34 is an upgrade from the original MyGica Remote. George S., Vancouver, B.C. September 23, 2016.